As a continuation of my plastic bag project, this graph from July 2011 shows almost the same data as June. You can see that a large number of tweets were irrelevant, but more tweets in this bunch were relevant. Due to people like @EarthActivists (self-declared arm-chair activists), @MayorSamAdams (actual mayor of Portland, Oregon) and other twitter users tweeting about their own personal experiences in grocery stores, there were a lot more tweets “for the ban”. However, since more people were tweeting about their experiences and the bans in towns in Oregon, Texas, and California, a lot more people tweeted “against the ban” this month. Last month, retweets and stories of bans around the world were the most prominent. This month, however, there were more tweets about reusable solutions and alternate uses than there were in previous months. Tweets about tote bags were the most prevalent, urging consumers to ditch plastic and go for reusable totes that you can buy in supermarkets and novelty stores. As I have mentioned in previous blog posts, I have a plethora of stylish reusable bags! The ones from Wegmans are my favorite, but I also have some Penn State ones that I use a lot too. 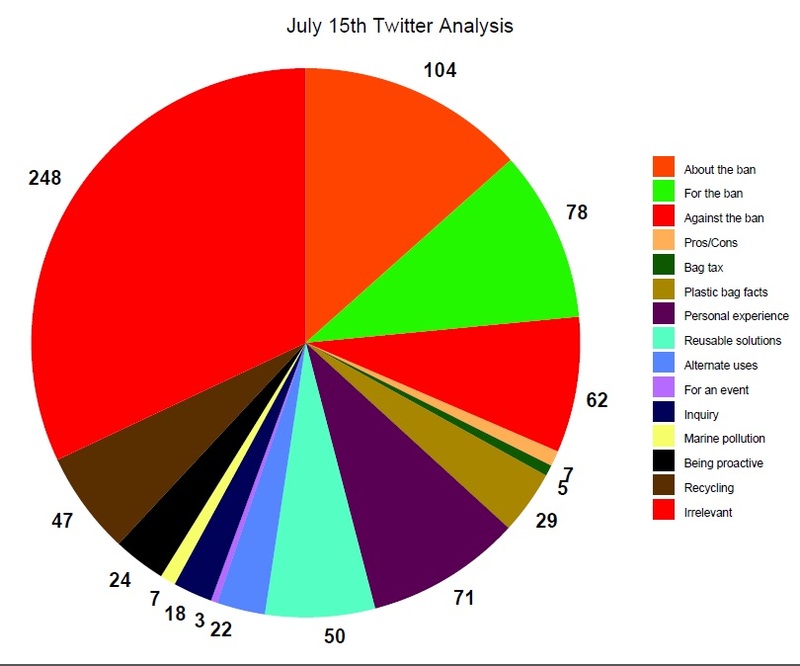 Thanks to @EarthActivists, many more tweets were in the “being proactive” category of July. They tweeted: “RT if you #recycle #plastic bags … :).” Many twitter users can respond to these kind of tweets because sometimes they get discouraged when it comes to recycling and saving the environment. Retweeting a user is very easy, and perhaps when they go to the grocery store next time, they will remember to bring reusable bags because of something they read on twitter. Another major Twitter player this month was @MayorSamAdams. His twitter bio reads as follows: “Mayor of Portland, Oregon, focused on public safety, education, jobs and economic development, arts, transportation, planning and sustainability.” He has some 44,000 followers, and he follows 45,000 people, including me! Since he is so proactive with his citizens and cares deeply about sustainability in Portland, his followers are more inclined speak up about issues. When an authority figure, celebrity or activist twitter account tweets something proactive, I found that twitter users were more likely to respond. Check out my blog next week for the final installment: August 2011. Keep tweeting about plastic bags!